My biggest problem is my hair staying locked! Can you tell me why my locs are always frizzy?! 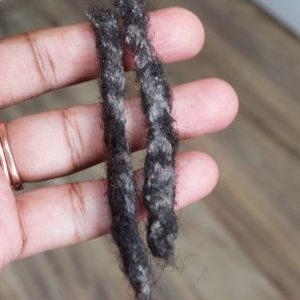 Are wondering why your locs never seem to stay neat? Or what some of the common causes of frizzy locs are so that you can avoid them in your journey? If this is your concern, then you’re in the right place! 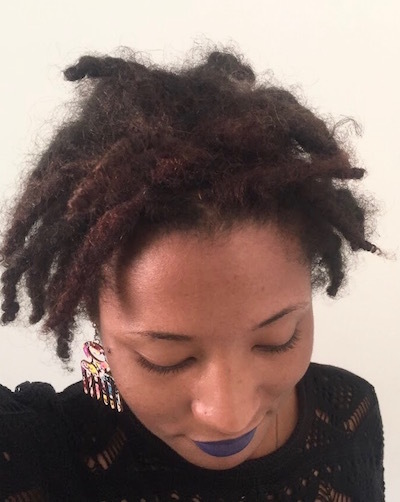 First I want you to know that frizz is definitely part of every (bold) loc journey! While there are several reason why your locs may be excessively frizzy, please keep in mind that only some of that frizz can be corrected— the rest you’ll have to grow through. When your hair is damaged, whether from heat damage or chemical damage, this causes your hair to have a high porosity level which results in a lack of moisture retention. Consequently, when your hair is lacking moisture it causes the hair to constantly remain in a state of frizz. The answer to damaged hair is NOT oil. Instead, you want to begin the work of hydrating your locs with moisture. 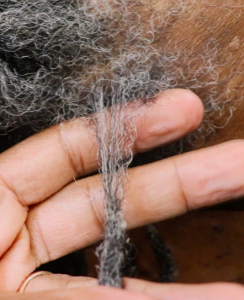 You can learn several at-home techniques for moisturizing your hair in the Guide to Moisturizing Locs. One of the biggest misconceptions with locs is that you can use all the same products that are “for natural hair”— however in most cases locked hair requires products formulated for locs. For instance, cream-based conditioners should not be used on locs because they are designed to detangle the hair and locs are a process of tangling the hair. Which means if you’re still using cream-based conditioner on your locs, you’ll likely experience frizz as your hair detangles itself from the core of the locs with each use. The texture of your hair plays a vital role in the amount of frizz you experience. Those of us with curly hair will have noticeably more frizz than our sisters with tightly coiled hair textures. However, once the locs are mature, if you’ve been cultivating your locs properly, will not have much frizz along the shaft. You likely already know this but I’ll just remind you again, you have to wear your satin scarf every night. Every. Night. Not wearing your scarf and sleeping on cotton sheets will draw out the moisture in your hair and cause excessive dryness and frizz, which leads to damaged hair (see section 1- damaged hair lol). Also, while you’re exercising, be sure to compress your hair, fully dry it afterwards, and use a scalp refresher to cleanse and hydrate the hair. If that was a loaded statement, head over to the “secrets no one told you about working out with locs” article for more details. 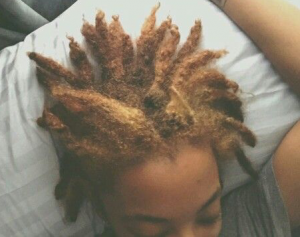 I hope these tips were helpful in understanding why your locs are always frizzy. Now, if you’re looking for ways to control the frizz, be sure to check out the next article, “5 Ways To Control Frizz“!